When do you need to reset MicroBot Hub? A MicroBot Hub can only be linked to a single MicroBot Cloud. If you wish to use your MicroBot Hub on a device that is authenticated on another Cloud, you need to reset it before adding it on the other device. As part of troubleshooting steps, it may be requested, at some point, to reset your MicroBot Hub. Please note that resetting is a last resort. When you encounter some issues while using MicroBot Hub, a reboot normally fixes most problems. Before resetting your Hub, please contact our Support Team here. How to reset MicroBot Hub? There are 2 methods to reset MicroBot Hub: Software Reset and Hardware Reset. Software reset. Tap on the 'MicroBot' icon at the top right corner or slide from left to right to access the left-sidebar, tap on the 3 dots [...] at the top and find your MicroBot Hub in the list. Then, tap on the red cross corresponding to your Hub. When the reset is completed, wait a few minutes until your MicroBot Hub is back in AP mode (LED blinks red and blue). 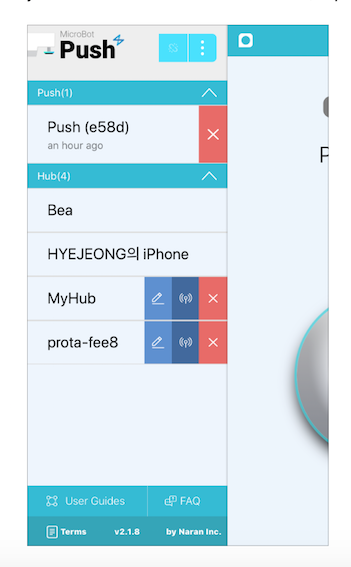 Once in AP mode, your Hub is ready to be added to another device. Hardware reset. Press MicroBot Hub's reset button for about 5 seconds, then plug in your Hub while maintaining the reset button pressed, and wait for 5 seconds. Then, release the reset button, check that the LED is blinking in red, and wait 10-15 minutes until your MicroBot Hub is back in AP mode (LED blinks red and blue). Note: During the reset process, your Hub's LED status will change successively: the LED will first blink red for about 10-15 minutes (reset), then will be blinking blue (booting) and then will flash red and blue (AP mode). See MicroBot Hub LED Status. WARNING! DO NOT UNPLUG your MicroBot Hub during the reset process as it may permanently damage the device. However, if the LED blinks red or blinks blue for more than 30 minutes, please unplug and plug in the Hub again as it may be stuck during the reset process.